🦸🏻‍♀️Matt and I watched Captain Marvel during the opening weekend and it was absolutely incredible! 🗺 We started organising travel activities for our Europe trip next month. Super excited! 💪🏼 I’ve been on top of my fitness and nutrition this month and as a result made some killer progress! 👩🏻‍💻 As part of my graduate scheme, I started my new rotation in one of the development teams. I’ve joined one of the squads and already feel very integrated in the every day Scrum activities. ☕️ One of my main objectives is to improve my general knowledge and skills on some back end development languages. As a result, I’ve been learning Java. So far, I’m really enjoying it! 🎤 I spoke at DevOps Sheffield meet-up! 🙁 I had to miss an online panel talk I was going to do for International Women’s Day because of my overloading capacity. Note to self: always be honest to yourself. 🧬 Matt and I attended HackMed 2019 this year! More on this soon – but it took me back to great memories of organising the event last year. 💜 To celebrate Women’s History Month, I interviewed Jennifer Opal and Ishan Beri for this month’s Inspiring Figures. It was fantastic to speak to them both about their various passions and interests. In addition, Jennifer’s interview was shared by Code First: Girls’ CEO Amali de Alwis on LinkedIn which was such a buzz! ☁️ Pawlean moved host to Matt’s Kubernetes Cluster. 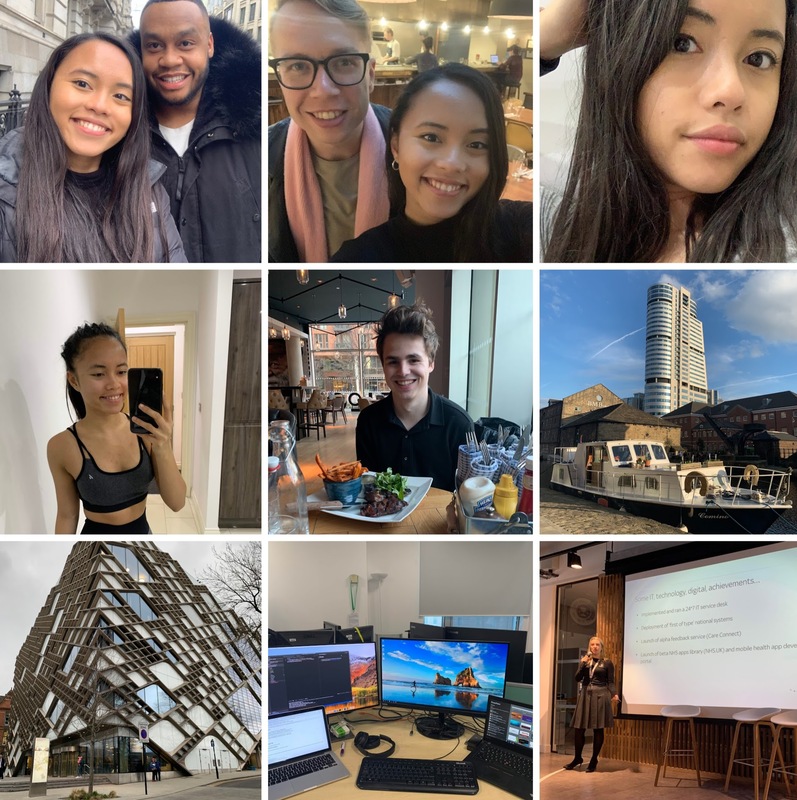 😊 Whilst I was in London this month for work, I had fit some time in to meet two friends from Twitter (it’s always so weird writing this!) Nathan and Cam – thanks for some great conversations! ⭐️ @LadyBossBlogger curated a list on the 240 Badass Female Bloggers of 2019 and I was listed number 11 in the technology section! 🥳 Although I don’t see my blog as purely tech, it was nice to get some recognition. My previous host, Kassy, has had to downgrade which meant that I had to look for a new host and move Pawlean. I spoke to Matt about the news and he happily offered to move me onto a Cloud Kubernetes Cluster he had been working on. I’m very grateful for Matt’s patience throughout the process. My blog is huge and embarrassingly a mess (even though it might not look like it from the outside) so we encountered some problems. Thankfully, we worked through them and now it is all running smoothly. With that said though, please do let me know if you find anything off! This whole move has motivated me to put some more effort in the general governance around creating posts to clean it all up a bit. Above all, I just wanted to say a huge thanks to Kassy for hosting me over the last 4 years, she was the one that helped me get back on track with blogging since I took a long hiatus all those years ago. Since January, I’ve been training with a PT and have been really enjoying it. My PT, Ryan, has really made me fall in love with training again and his constant support has pushed me to get better and better every single week. Eeeeeep, I’m so proud of my progress. My training plan is a lot of fun, challenging and has already given me some fantastic results both aesthetically and strength-wise too! I can’t wait to see what else I can do. I did the same talk I did at BCS South Yorkshire Branch’s event last month. And to be honest, I’ve done this same talk several times before at various other conferences and events. The problem? DevOps meet-ups are usually very male-dominated. I knew this going in but I didn’t realise until I got there how much it actually impacts my confidence – it’s insane. However, as I powered through my talk and started answering some questions it turned out all fine. Great – in fact! Everyone welcomed me with open arms, and I ended up chatting to some fantastic people around the ways we can improve diversity in the workplace and at meet-ups. As I left the event, I felt that I made somewhat of a positive contribution more than ever before. It wasn’t my usual crowd, but that’s a good thing! It hopefully left something to think about and created some general awareness. For me personally, it was another push outside my comfort zone. Win. Thanks again for having me DevOps Sheffield! Quick shoutout to folks like Andy who have been working extensively on creating more inclusive environments at events like these. It’s been a whole year since I wrote this thread. It feels good knowing how far I’ve come since. 😄Celebrate your achievements! 🎬 Captain Marvel – have I said this already? 👀 Avengers: End Game comes out!!! I always hate switching hosts. Had to a few months ago since my host was shutting down. I haven’t had a friend host me for years. XD Though I do host a few friends! But sounds like overall you had a really good month! Haha, when I look back at my month I have the same reaction! I’ve moved hosts TWICE in a month. Didn’t realize it would be so much work. Long story short, I moved to DreamHost, and hated it because of the lack of CPanel (didn’t realize until after I had moved, and had to figure out the hard way), and because they were using an outdated version of PHP, which pretty much broke my site. Weeks later, I moved over to HostGator. I’m so excited for you that you’re meeting Georgie and Nick, but I’m also super jealous. I expect to see photos on Twitter, Instagram, and your blogs!